On our day of shopping in the States, we happened across a new frozen yogurt place at Bellis Fair. I thought it’ll be good, since this was the land of the Pinkberrys and the Red Mangos. Yogu-san‘s decor is very, very minimalistic. Too minimalistic in my opinion. Their mascot is hella cute though! Oh well, it’s the quality of their products that’s most important. When we were their the worker was cleaning the machines. Nice to see people actually cleaning them. Like most frozen yogurt places, they have Original, Green Tea, plus a seasonal flavor. 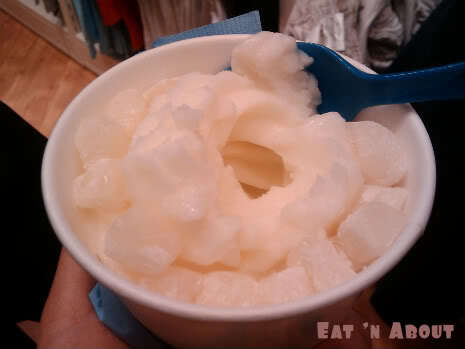 Yogu-san had 2 seasonal flavors when we were there – Mango and Coconut. Mango was alright, the Coconut needs more coconut flavor. The Green Tea and Seasonal flavors cost $1 more at $3.50USD. Each additional topping was $1USD. I was happy to see that they have Mochi here also. It tastes exactly the same as Qoola’s. 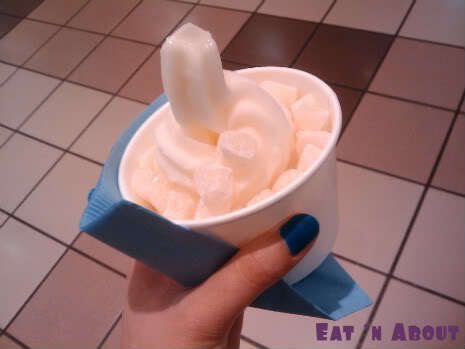 They also have fruits and other dry toppings similar to what you would find here. I ordered the Original with Mochi. Unfortunately, the yogurt was not as nice as the ones we have here. Theirs was sort of icy, as you can see on the spoon above. Flavor was there, but the consistency wasn’t. I was disappointed. Not sure if it’s because it’s so icy, it melted pretty quickly too. Also not sure if this was just a one-time occurrence, don’t know if I’ll go back to find out. Well, you’re asking someone that highly recommended it so….YES! COME TO RICHMOND!!!! 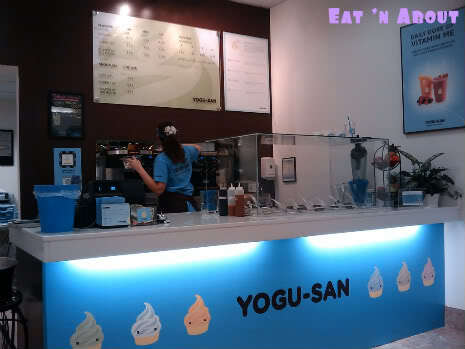 Working only minutes away from Yogu-san and purchasing a great deal amount of yogurt from them. 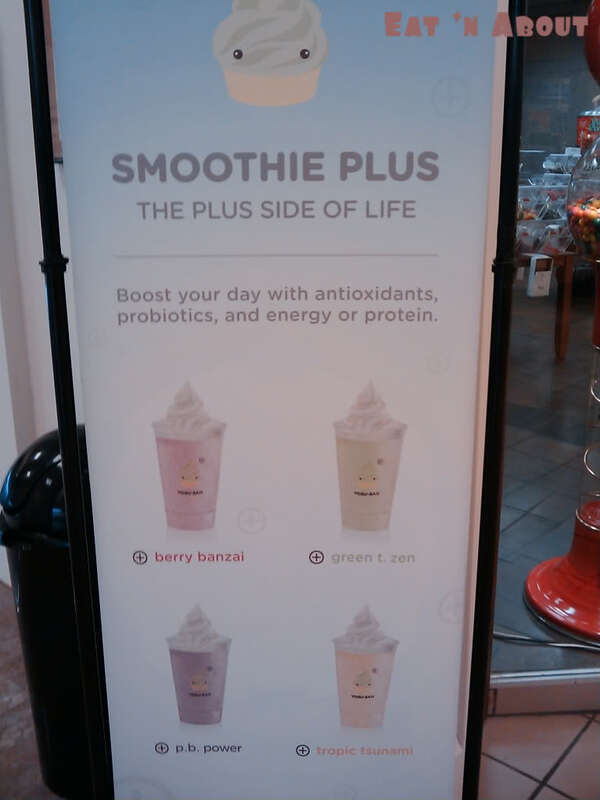 I’ve been to kirklands “Shnoo yogurt” and other places when i visit friends but falls short to what yogu tastes like. I love the tartness it brings *real*, and how its used from quality materials; nancys yogurt i think. As for the decor, i love it! Really, how many places have original artwork with a cute alien yogurt creature. But yeah, i got to say though they could use some music. Theres always an awkward silence when i’m ordering. Nonetheless nice pictures. 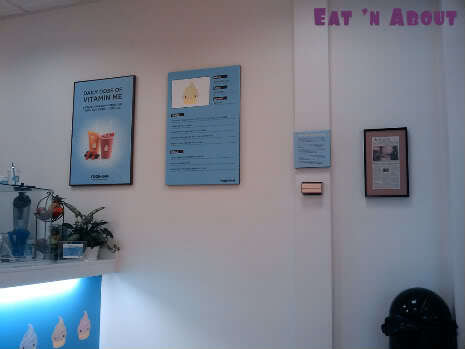 I have been to every yogurt store possible!! 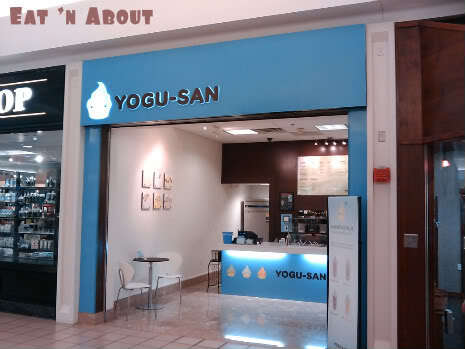 By far yogu-san has the best tasting yogurt. Keep in mind you are having yogurt not soft serve!! Will continue to come Yogu-San and enjoy it everytime.